The 1960’s saw a definitive resurgence of occult obsession in mainstream pop culture. Therefore, it is not surprising that a correlative influx of supernatural sightings followed in the wake of the reemergence of paranormal phenomena in the public psyche (like alien/ UFO sightings after the release of “The War of the Worlds” in the 40’s). One of the single most sensationalized occurrences of this trend appears in the media phenomena following the Highgate Vampire. This occurrence retains, to this day, its mysterious reputation in occult circles as well as in the general public’s consciousness. So what really happened at Highgate? The Highgate Cemetery was built in 1839, and quickly grew into the place to be buried in the Victorian era (Karl Marx, Douglas Adams, Michael Faraday, and George Eliot are among the interred). As such, it was featured in Bram Stoker’s Dracula as the place where the young victim Lucy Westenra was buried, and began creating her child vampire army (which is a bit ironic, considering the events that occurred there nearly a century later—or maybe not). However, after the Victorian’s creepy obsession with dead people went out of vogue, the cemetery rapidly became extremely dilapidated and overgrown. By the 1960s, this decrepitude proved a prime spot for a group of occult oriented teenagers to begin hanging out, holding séances, and performing general vandalism. Thus began the grassroots initiation of the idea that something strange was roaming around Highgate Cemetery. In 1963, two teenage girls reported the first recorded ghost sighting. Apparently, on a leisurely midnight stroll through the cemetery, the sixteen year olds had been disturbed by a couple of dead companions who had gotten sick of being cooped up in their tombs, and had also chosen to get some air. A couple of weeks after this announcement, a couple reported seeing a single lurker peering out at them from between the cemetery gates. Needless to say, far from encouraging people to maybe choose a different location for their evening strolls, this only spurred the interest of the supernatural enthusiasts even further. Enter David Farrant, vampire hunter. A long time Wicca enthusiast and head of the British Psychic and Occult Society, he was one of the many pilgrims to the site of these alleged hunting's. 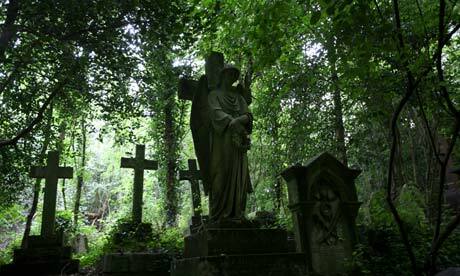 He spent the night in Highgate in December of 1969, where he claimed to have seen a “gray figure”. Evidently not satisfied with his own sighting, Farrant solicited input from other people in the community in February of 1970, asking if they had also had an encounter in the cemetery. The positive responses to the letter affirmed the idea that the cemetery was “haunted”, with a multitude of shape-shifting ghosts that changed, it seems, with each viewer, as no two “sightings” matched up—they included a tall man in a hat, a ghost on a bike, a woman in white, the previously mentioned glaring face between the bars of the cemetery, a person wading in a pond, bells ringing, and voices calling out. Farrant also reported seeing dead foxes, drained of all of their blood, littered about the cemetery. Today, he scorns the idea of the Highgate Vampire, stating that it was all sensationalized hype based on his statement that the specter had vampiric qualities. What really happened, he says, is that Highgate is built on ley lines, which, according to the fine science of dowsing, act as a transmitter for psychic energy, and enable a vampire to mysteriously appear under the right circumstances. Now, we could just dismiss Farrant as a little off his rocker, grab our garlic necklaces and holy water, and call it a night, but the Highgate story still has yet another vampire hunter to its name (so there really must be a real life vampire, right?) Sean Manchester, Catholic priest and bishop, self promoted killer of “scores” of vampires, and professional exorcist got his start in the Highgate case, although he came a little late to the Highgate sleepover scene. 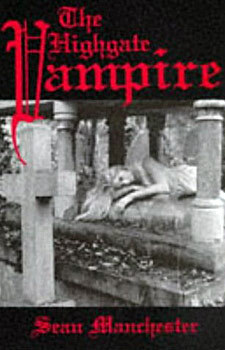 In an interview with The Hampstead and Highgate Express on February 27, 1970, he is quoted as saying that the entity living in the Highgate Cemetery was in fact a “King Vampire of the Undead”, a medieval black magic practitioner who had, for inexplicable reasons been transported from Wallachia (the home of Vlad the Impaler, basis for Dracula) to England, sometime in the early 18th century (and then, I suppose, moved again to Highgate in the 19th century when it was built—this part of the story is a little murky). He later alleged that this statement was highly exaggerated by the journalists in charge of the interview, and then rewrote the exact same account in his book on the incident. So began what was, by his account, to be a thirteen year crusade against this evil globetrotting vampire. These two hunters came head to head when both were selected by someone with a fabulous sense of humor to be interviewed back to back on Friday, March 13, 1970. Manchester announced, in his interview, that he would be personally leading a mass vampire hunt against the entity. This spurred on a mob of would-be vampire hunters, eager to see the duel with the devil that Manchester had vividly described. The crowd attempted to climb over the locked gates and walls into the cemetery, despite the attempts of police to detain them. Manchester, in his book The Highgate Vampire, recounts the extremely dramatic events that allegedly unfolded that night (he was unseen by any press, police, bystanders, or ghosts). After sneaking into the cemetery, he was lead to a catacomb by his unnamed psychic sleepwalking female companion that was the vampire hot spot. Unable to force the door open, he had to descend through a hole in the ceiling (he assures that it was already there). There, he found the tomb full of completely empty coffins, which he filled with garlic and holy water. Five months later, a woman’s charred, headless remains were found in the graveyard, in what police believed to be a bizarre black magic ritual. Deeply encouraged, Farrant and Manchester redoubled their efforts. Farrant began sleeping outside the cemetery with a stake and a crucifix, which led to his arrest in August 1970 (the judge took pity on him, and acquitted him at trial). Manchester took the more legal route, again by his own account, entering the cemetery during the day. His trusty sleepwalking psychic again led him to a family tomb, where he found bodies. Enraged, he tried to stake the corpse, but was stopped by one of his companions, who apparently thought that attacking and mutilating dead bodies was a little unnecessary. He implies he had to deal with this same vampire later, this time in a basement of a house near Highgate. And here, the story, in essence, ends. As previously noted, Manchester hunted (and claims to have eradicated) the Highgate Vampire for thirteen of his illustrious thirty-three years of hunting. Both he and Farrant have written multiple books on vampire hunting, the Highgate incident, and other occult stuff. In 1971, a girl claimed to have been knocked down in Highgate by a tall, black figure with a deadly white face, but was saved when a car stopped to help her out. In 1974, a man walking his dog came back to his car to find what he reported was a freshly dug-up corpse waiting for him, and Farrant was again arrested for vandalizing tombs (he blamed it on the Satanists). Also in 1974, Farrant and Manchester scheduled a magician’s duel, which unfortunately never went off. However, they have continued their lifelong opposition for who is the better exorcist/hunter/Highgate expert/author.